1. Mr. Keith at Felt-tastic Flannelboard Funtime put some AMAZING detail and hard work into his version of Planting a Rainbow. He has a fun action rhyme with it to get the kids digging and planting their seeds. It's perfect for any storytime about colors or spring or gardening or when you want to impress people with felt skills--Lois Ehlert herself would be proud! 2. 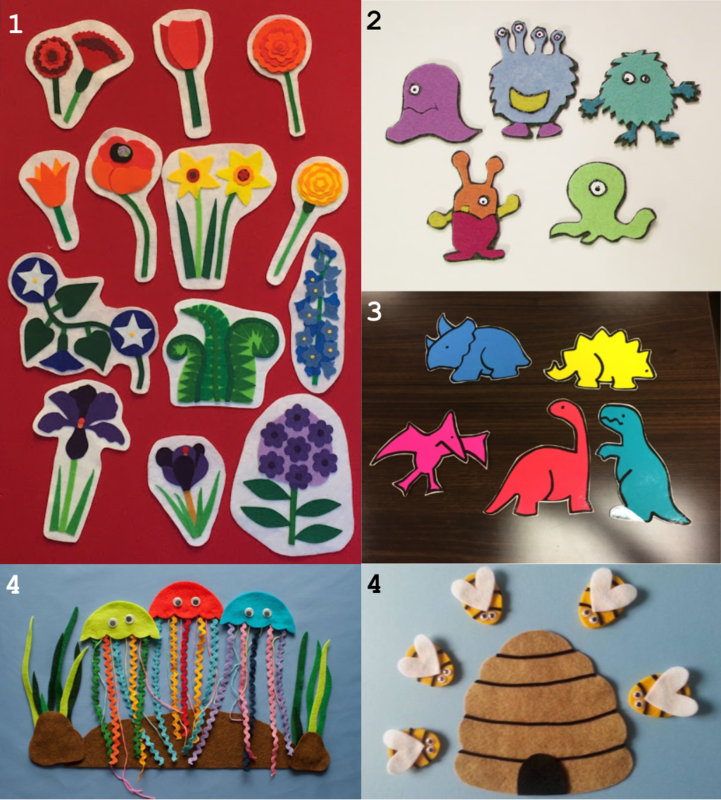 Wendy from Flannel Board Fun shared her five adorable friendly monsters (or aliens or creatures or what-ever-you-like). She created it to be used in a number of ways, whether it be five little monsters jumping on the bed or five little aliens jumping on their planet (yes, seriously, it's so cute). 3. Mollie of What Happens in Storytime recycled an awesome dinosaur flannel called All Around the Swamp that uses The Wheels on the Bus tune for a fun action song that kids love. There's also a template included! 4. Kate from Felt Board Magic has TWO great flannels to share. The first includes three super colorful and fun jellyfish (love all the ric rac!) that goes with a counting rhyme--both counting down and back up. The second flannel is five adorable bees and their hive for more counting practice! 6. Laura at Literacious also used a counting rhyme, to count her five awesome flannel kites. She used them during this last spring; they're also colorful and would be fun to for practicing colors. Cute and effective! 8. Shawn from Read Rhyme Sing has a flannel for her story, "Where's My Mom?" about a cute little monkey looking for his mom. Butterfly tries his best to help, but it definitely takes a few tries. Great to tuck away for mother's day, or reverse roles for an upcoming father's day storytime! Or use it anytime to practice naming all kinds of animals! 9. 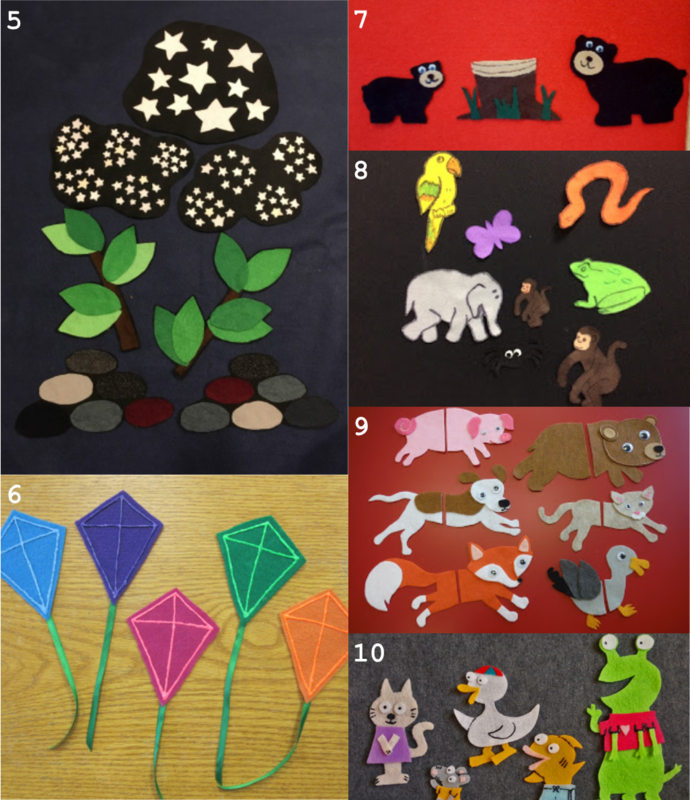 Laura of Library Lalaland has more animals to share with her beautifully-done adaptation of Tails Chasing Tails, a cute board book by Matthew Porter. It's a lot of fun for the kids, who get to guess animals based on their tails. And kudos to Laura to having the courage to cut her beautiful flannels in half! 10. And then to wrap things up, here's my idea for a flannel to go along with Mo Willems' book, Cat the Cat, Who is That? to use while reading the book, or for some more fun animal identification. Thanks, everyone, for posting your fantastic ideas! Don't forget to check out the FF website to learn more, or see their Pinterest page for even more ideas, or follow them on Facebook! I love the way you did the roundup--it looks great! What a fantastic list! The number 9 link isn't working for me , though. Oh, I'm so sorry. Thanks for letting me know--should be all fixed!